The response to the awesome phenomena article was amazing, I’d really like to thank you all! I was really surprised to see how many of you actually contributed and sent me more pictures of awesome phenomena, so I’ll definitely do a follow up in a few days, mentioning who gave me the tip, so keep an eye out guys. Meanwhile, Daniel M. gave me a small list of phenomena called ‘photometeors’, and after doing a little research, I have to say they’re definitely worth looking into. A Photometeor is a luminous phenomenon produced by light from the Sun or the Moon, whether it’s produced diffraction, interference, reflection or refraction. They can be observed either in or on clouds, in hydrometeors or lithometeors or in less thin air. 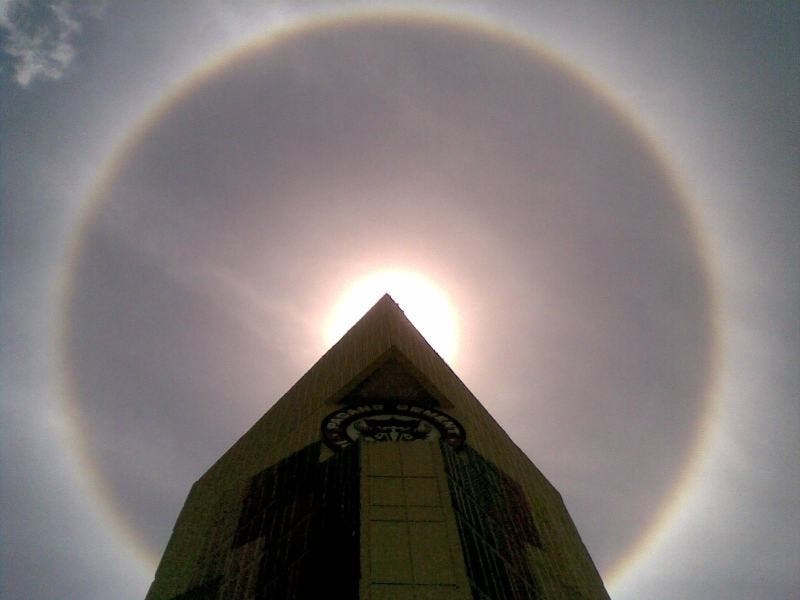 The Halo includes meteorological phenomena consisting of colored or white arcs, generally surrounding the Sun or the Moon, formed by light refraction in the crystals in the cirrus clouds. There are many types of halos, and the shape and arrangement of the crystals determines the type of halo seen, with the parhelia and the 22° halo being by far the most common. 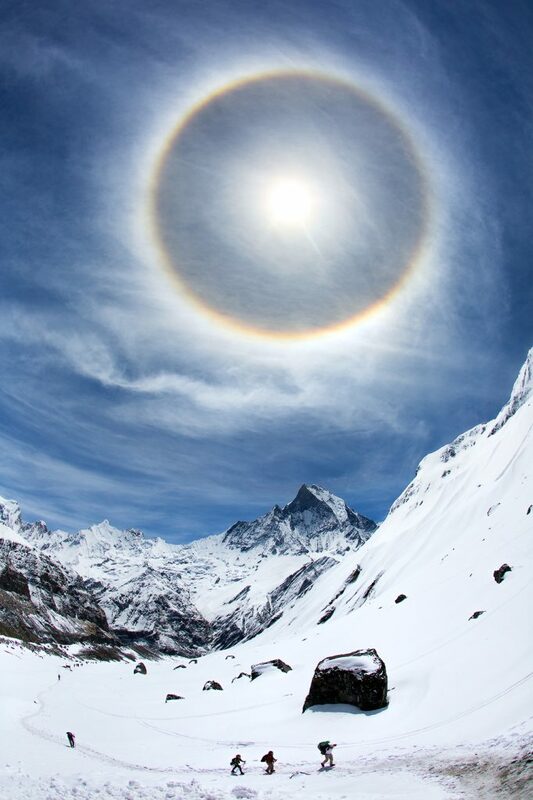 The word halo comes from Greek and it was used to define a sun or moon disk, or a circular shield. 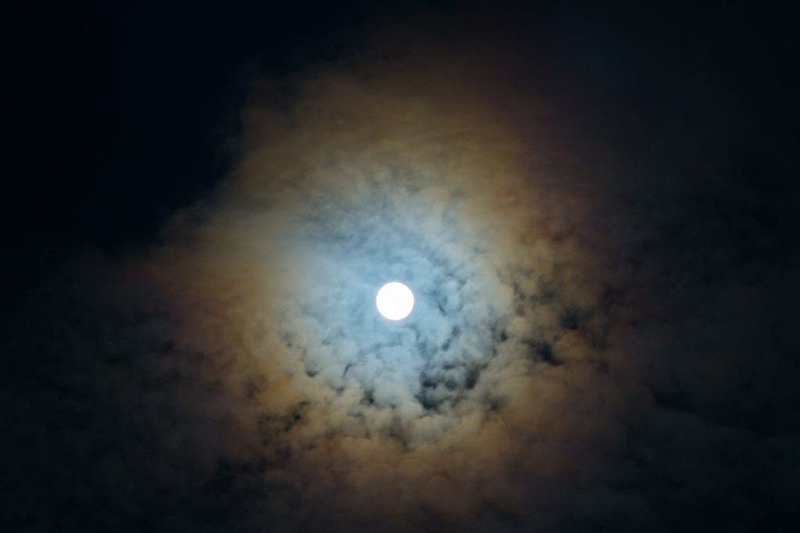 In the days before meteorological predictions, halos were a very good indicator that the weather was about to change.When produced by the Sun’s light, the halo may have a number of colours, but halos produced by light reflected by the moon are always white. 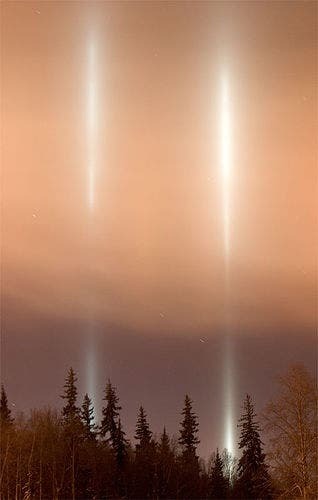 Light pillars are also produced by ice crystals, just like halos, but they come as a result of only reflection, not refraction too. The result in this case is… well the name pretty much says it all. Photo by Joseph N Hall. They can be formed by the sun’s light or moon’s reflected light, but they can also be formed by streetlights; howeever in this case the result is much less spectacular. 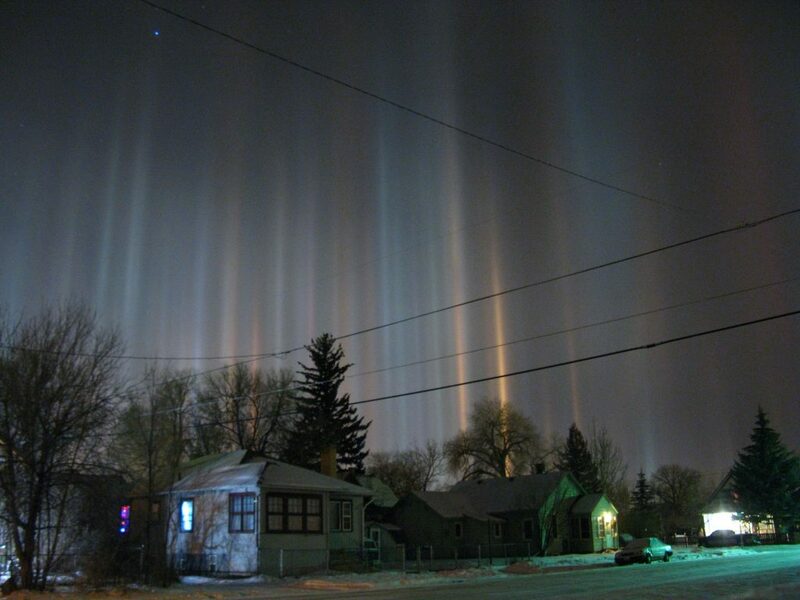 What happens is the light is ‘trapped’: it reflects on ice crystals with near horizontal parallel planar surfaces. As you can see, the results are just amazing. Coronae are one or more sequences (but usually maximum 3) of thin colored rings centered on the sun or the moon. They are not really uncommon. Though this can be hard to observe sometimes, the inside ring on each sequence is violet and the outside ring is red, while the other colours of the rainbow are inbetween. They are different from the halo because they are a result of the diffraction of light, while halos are a result of refraction. 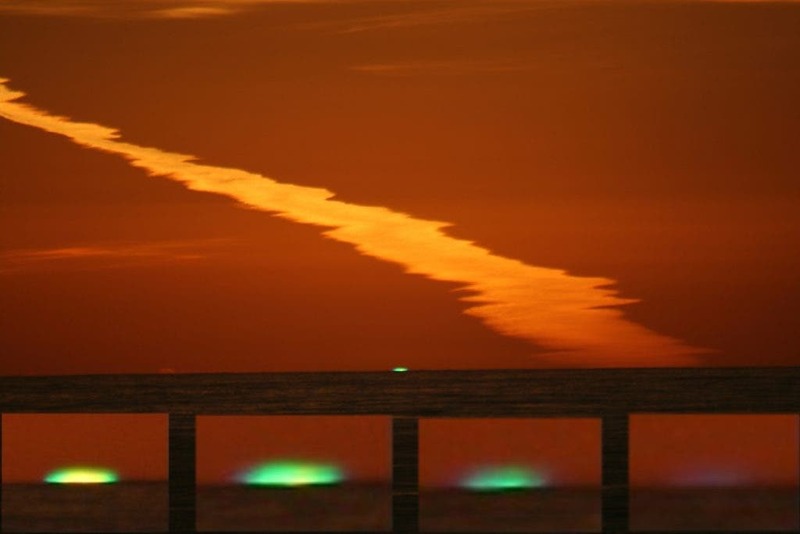 The green flash is an optical phenomena consisting of a green coloration often in the form a flash of short duration (no more than 2 seconds usually) that occurs shortly after sunset or just before sunrise. The stages of a green flash. Photo by Brocken Inaglory. The explanation lies once again in refraction: light moves more slowly in the lower air, due to its higher density, so the sunlight follows paths that curve slightly in the same direction that the Earth is curved. 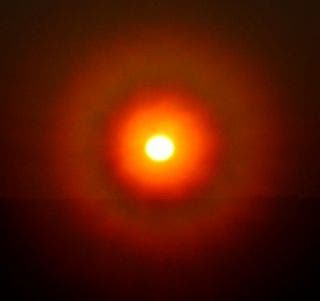 Higher frequency light (green) curves more than lower frequency (red/orange) so green remains visible from the upper limb of the setting sun while the red and orange rays are obstructed by the curvature of the earth. Glory is a phenomena that appears much like a biblical saint’s halo, produced by light backscattered (a combination of both refraction and reflection, and diffraction). It really is much like a halo, but a glory has multiple colored rings, usually all the colors of the rainbow are easily visible. Glories are seen when the observe is directly between and cloud of refracting water droplets. 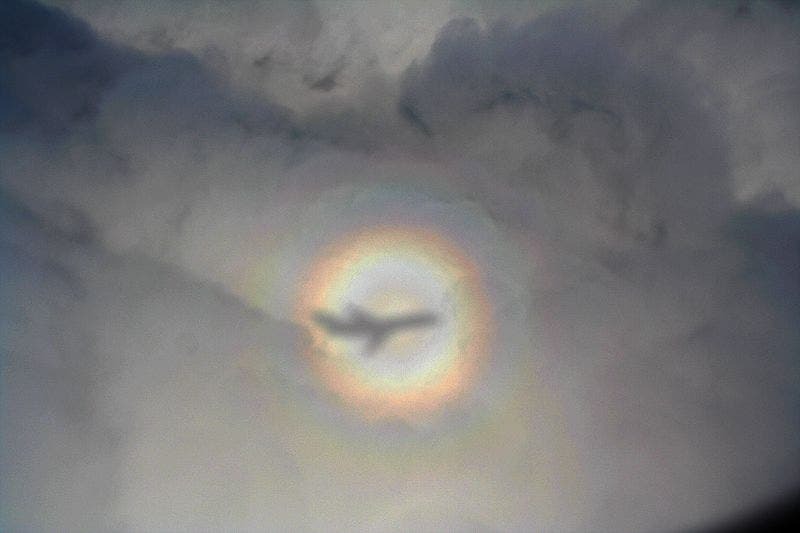 As a result, they are often seen while airborne (when glories surround a plane, they are commonly called the glory of the pilot and pilots believe they are a sign of luck). 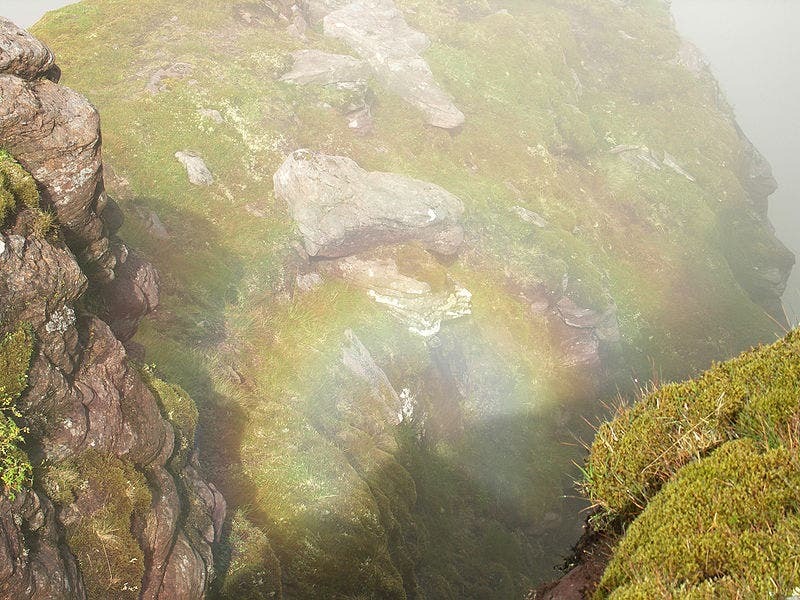 There is also an increased chance of seeing glories when on the mountains, or even on high buildings. Irisations were named after the Greek goddess Iris, goddess of rainbows and the messenger between gods and humans. 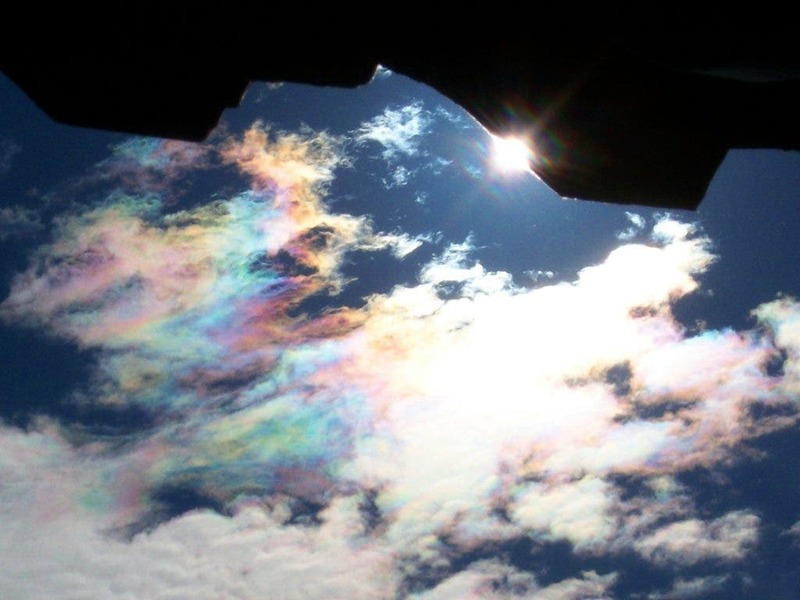 It’s basically a bunch of multiple mixed iridescent colors produced by sunlight being diffracted in the clouds. Sometimes they appear as stripes paralel to the edge of the clouds, and when they appear, they often appear on lenticular clouds. The droplets of water diffracting the light have to be very uniform in order for the phenomena to take place. You’re probably already familiar with mirages, as they’ve been used a lot in virtually every movie that has a desert (or some area really hot) in it. 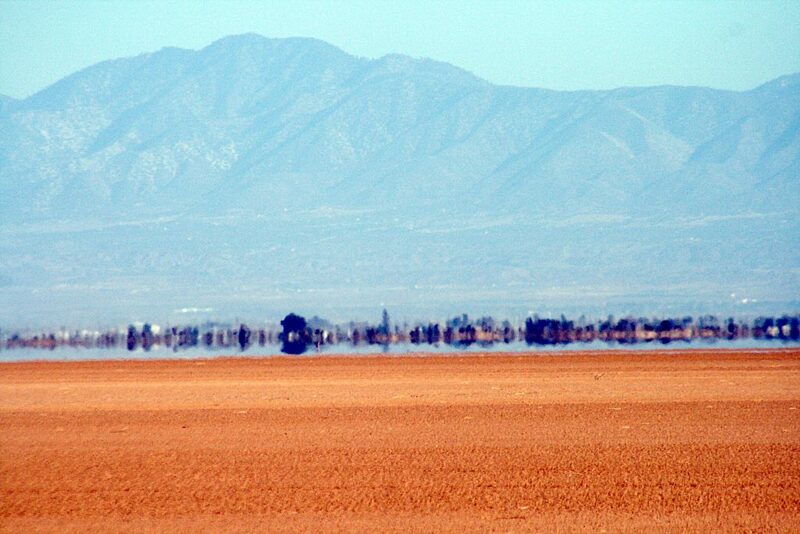 A mirage is actually a naturally occuring phenomena in which light rays are bent and they produce a displaced image of distant objects, making them appear closer, or even an image of the sky. Desert mirage. Photo by Brocken Inaglory. Basically what happens is the mirage makes things seem to be in a different place than they actually are. Light rays are refracted to form the image, but the interpretation of that image relies greatly on the human abilities. Really often, inferior images on land are believed to be the mass of water. The physical explanation may seem complicated, but it’s actually very simple: colder air is denser than warmer air. Denser air has a greater refractive index. As light passes from a colder mass of air to a significantly warmer mass, light bends away from the gradient of the temperature. Mirages can be inferior, superior, or Fata Morgana. 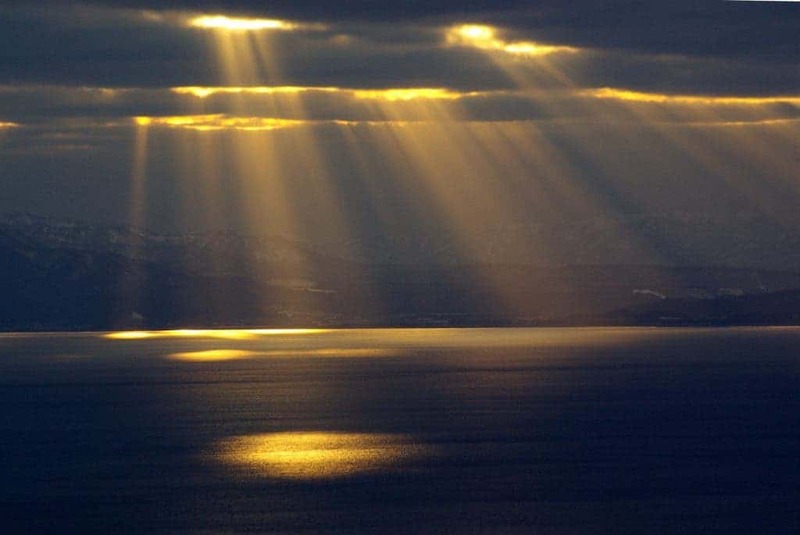 Crepuscular rays are rays of sunlight that appear to come from a single point in the sky. They are columns of air through which the sunlight passes separated by shadowed regions. The near-parallel rays appear to diverge due to linear perspective, and they can also be viewed underwater, and are most common in Antarctica and arctic regions. 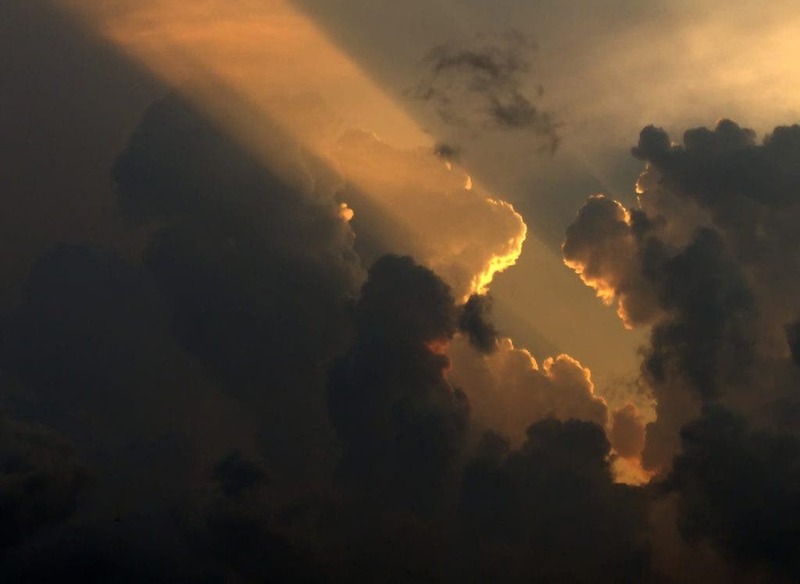 There are three forms of such rays : those that go through low clouds, those that diverge from behind a cloud, and those that radiate from below the horizon (pinkish or reddish rays).